Today is Nag Panchami ( नाग पंचमी) within the Hindu tradition observed throughout India and also in Nepal. It occurs on the fifth day of the waxing half of the lunar month of Shravan according to the Hindu calendar. 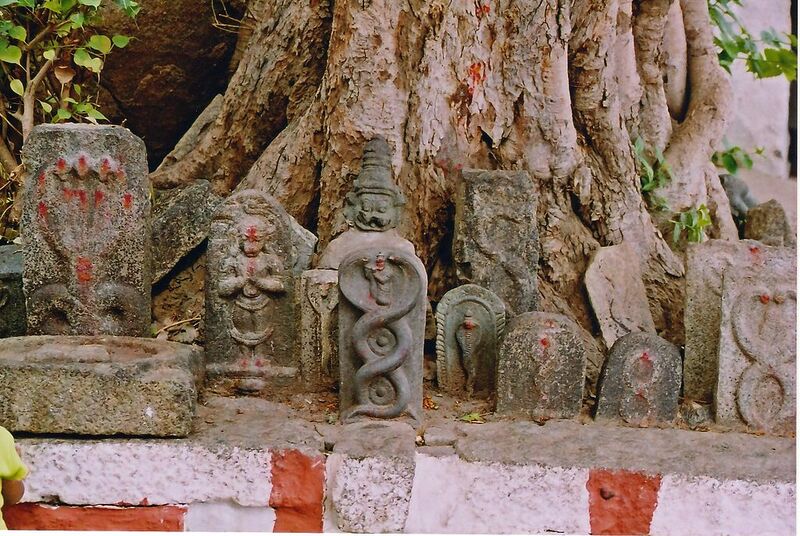 There are many legends in Hindu tradition concerning the importance of reverence for snakes, and on Nag Panchami they are especially honored. In the Hindu epic, Mahabharata, Janamejeya, the son of King Parikshit of the Kuru dynasty initiated a snake sacrifice known as Sarpa Satra, to avenge the death of his father from a snake bite by the snake king, Taksaka. A sacrificial fireplace was specially erected and the fire sacrifice to kill all snakes in the world was begun by Brahmin sages. The sacrificial ceremony performed in the presence of Janamejaya was so powerful that all snakes began to fall into the Yagna kunda (sacrificial fire pit). When the priests found that only Takshaka (who had bitten and killed Parisksihit) had escaped to the nether world of Indra seeking his protection, the sages increased the tempo of their reciting of the sacrificial mantras to drag Takshaka and also Indra to the sacrificial fire. Takshaka had coiled himself around Indra’s cot but the force of the sacrificial yagna was so powerful that even Indra, along with Takshaka, was dragged towards the fire. 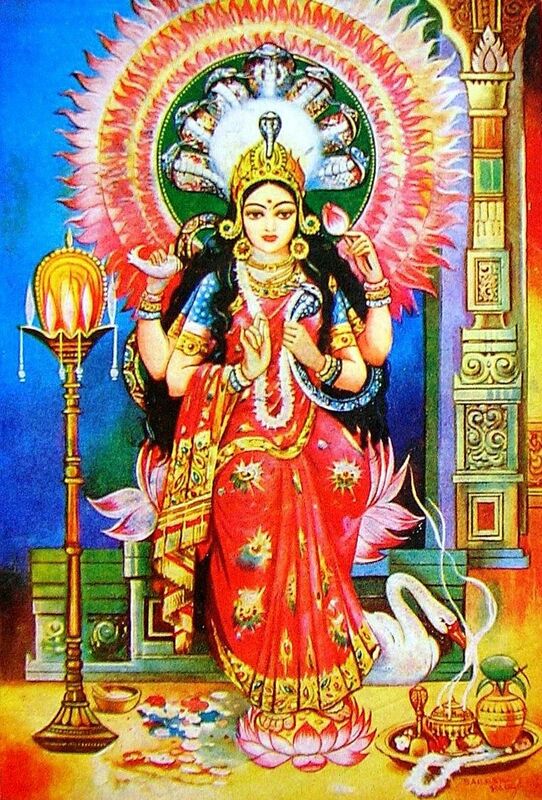 This scared the gods who then appealed to Manasadevi (goddess of snakes) to intervene and resolve the crisis. She then requested her son Astika to go to the site of the yagna and appeal to Janamejaya to stop the Sarpa Satra. Astika first impressed Janamejaya with his knowledge of all the Sastras (scriptures), so the prince gave him the chance to seek a boon. Astika requested Janamejeya to stop the Sarpa Satra. Since the king was never known to refuse a boon granted to a Brahmin, he relented, the yagna was stopped and thus the lives of Indra and Takshaka were spared. This day, according to the Hindu Calendar, was Nadivardhini Panchami (fifth day of bright fortnight of the lunar month of Shravan during the monsoon season). Let all live peacefully without any turbulence. In some regions of the country, the milk is offered along with crystallized sugar, and rice pudding (kheer). In addition there may be an offering of a lotus flower which is placed in a silver bowl. 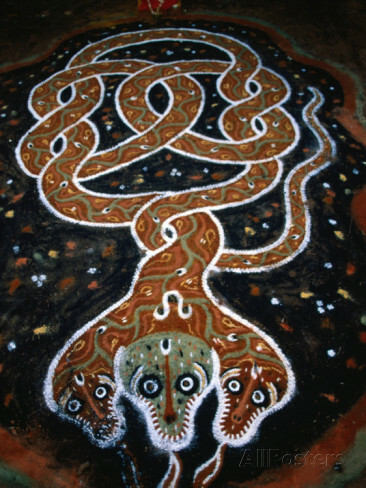 In front of this bowl, a rangoli (colored pattern) of a snake is created on the floor with a brush made of wood or clay or silver or gold with sandalwood or turmeric paste as the paint. The design pattern may resemble a five hooded snake. 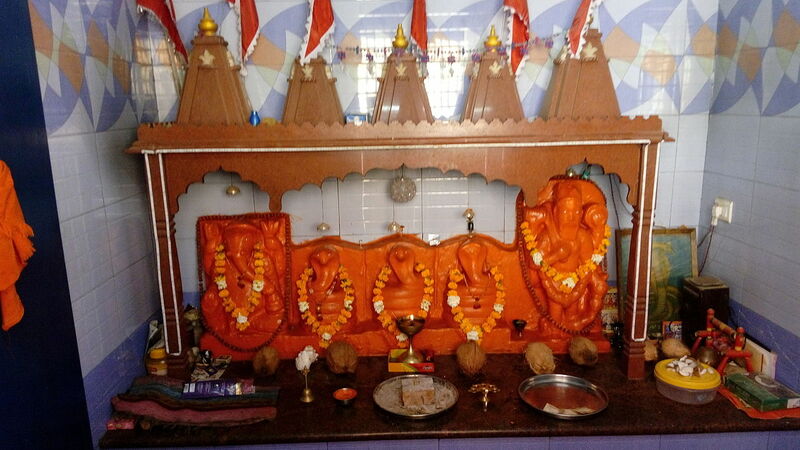 Devotees then offer homage to this image on the floor. Apart from scriptural allusions to snakes and festivals, there are also a number of Hindu folk tales. One such tale concerns a farmer who had two sons, one of whom killed three snakes during ploughing operations. The mother of the snakes took revenge on the same night by biting the farmer, his wife and two sons and they all died. Next day the farmer’s only surviving daughter, distraught and grieved by the death of her parents and brothers, pleaded before the mother snake with an offering of a bowl of milk and asked her for forgiveness and to restore the life of her parents and brothers. Pleased with this offering the snake pardoned them and restored the farmer and his family to life. 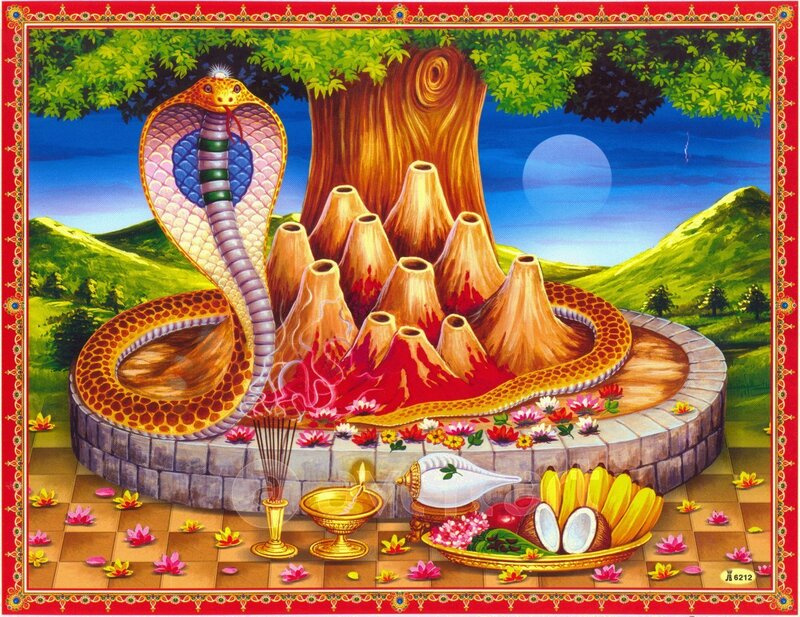 In Hindu tales snakes are related to the rainy season – the varsha ritu in Sanskrit. They are also depicted as deities of ponds and rivers and are said to be the embodiment of water as they spring out of their holes, like a spring of water. There are numerous foods that are eaten on Nag Panchami. Steamed balls made of various kinds of flour dough and flavorings are very common. Such foods are popular because it is considered inauspicious to use a knife in the preparation of food on this day. 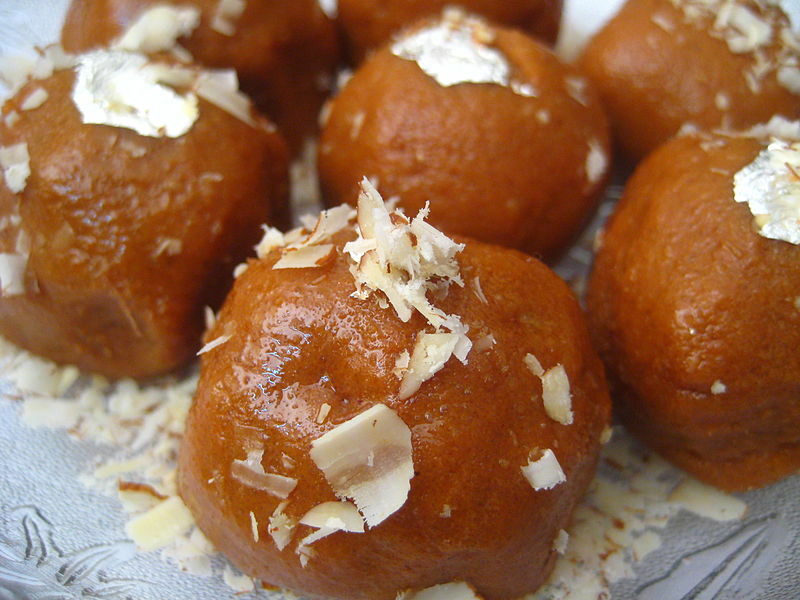 Here, for example, is a step-by-step recipe for kuler ladoo made with millet flour, raw sugar, and clarified butter. There’s also besan ladoo which is more to my taste. Besan is also known as gram flour or chickpea flour, a staple in Indian cooking. You can find it in health food stores and online. Heat 1 cup of clarified butter in a deep skillet over medium-low heat and add 2 cups of besan. Cook slowly, stirring constantly with a wooden spoon until the besan starts to brown. Add 2 cups of raw sugar, stir to mix well, and remove from the heat. Stir in 1 cup of chopped nuts, and a little powdered cardamom if you wish. Cool, and roll the paste into balls about the size of a walnut.